Do you adore cats? Well, if it is so, in this funny little game you must change your attitude to them! 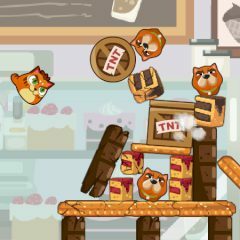 Fill the cannon with various types of these fluffy sweet animals, drag the arrow and... press the button! Your task is to smash as many objects on the platform as you can. Good choice and have fun!